Being an avid internet user, people tend to have a significant number of passwords saved on their browsers for quick access to their online accounts (like Facebook, Twitter, Gmail). Using these saved passwords, the browser automatically fills in all the login details you visit the same site next time. Making use of saved passwords, users can easily escape from the tedious task of remembering passwords and manually filling the details every time they login to their accounts. Usually, passwords can be saved in your browser, that are locally stored in the computer and can be accessed from within the web browser. But what if someone gains access to your computer in your absence? It gets easy for the person to steal all the passwords you have saved in your browser and peep into your personal and confidential information. 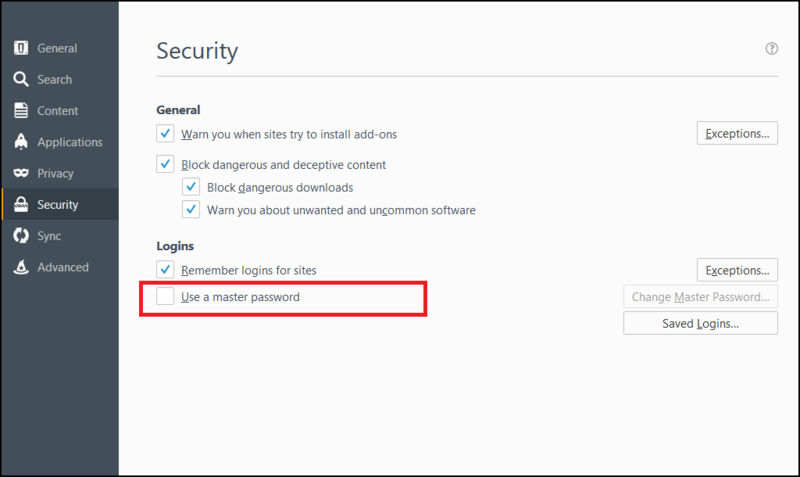 However, you can gain peace of mind by adding an extra layer of security to your saved logins and passwords using the Firefox Master Password feature so that the browsers can be secured against such snooping attacks. 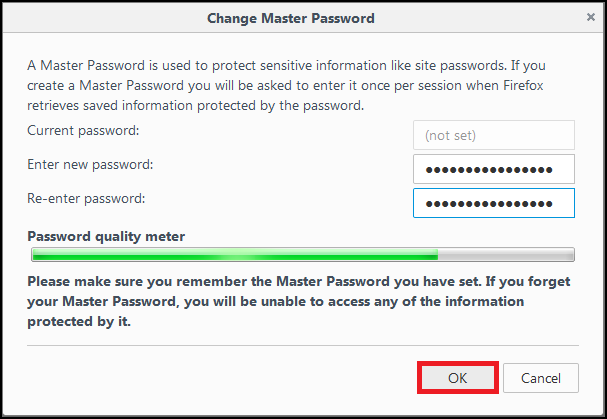 Once you have set the Master Password in your browser, you will be required to enter this Master Password to access any stored logins. 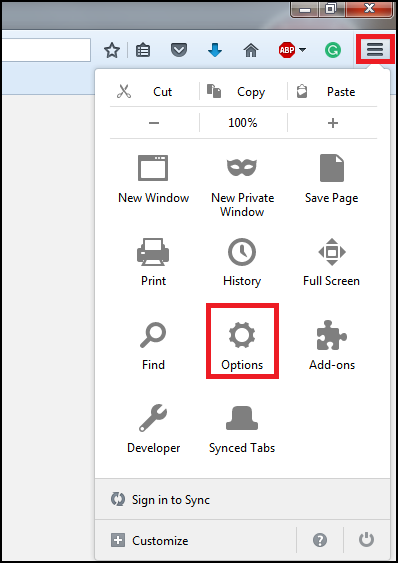 Click on Menu button (hamburger button) on the upper right corner (the one with three horizontal lines) and then choose Options. Select the Security tab on the left. From the right pane under Security, checkmark the option Use a master password. 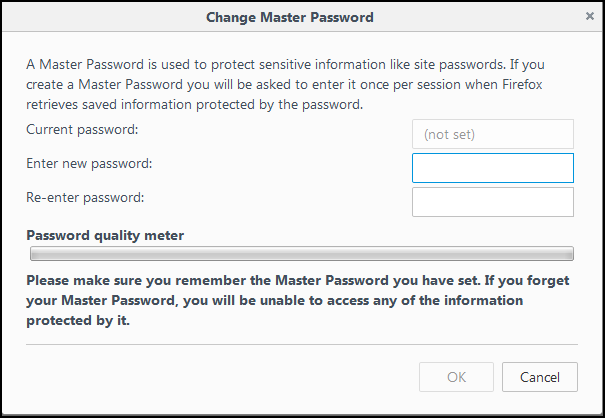 Once you check mark the option, the Change Master Password dialog appears that will prompt you to set a Master Password. This Master Password will always be required before accessing any of your stored logins in the browser. Make sure you enter a strong password, as it acts as a security guard for all the saved password and leads to passwords for all your website accounts saved in your browser. A confirmation message will appear after the Master Password has been successfully created. It is definitely a good idea to set a Master Password if you don’t want other users snooping around your e-mail accounts or your Facebook account. 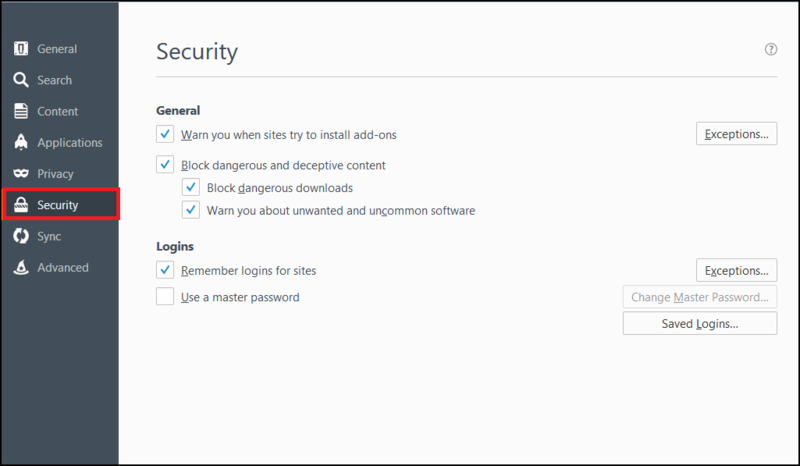 With the Master Password, you get an enhanced level of security and gives a great boost to the safety of your saved logins in the Firefox browser.